For Premier MRI/CT, an outpatient diagnostic imaging center in Southfield, MI, time is of the essence, both for the approximately 500 physicians they partner with and the patients they serve. Premier provides thousands of CT, MRA, MRI and X-rays each year to the tri-county community near Detroit. Before FreedomPACS, Premier and their ordering physicians were losing critical time, money and productivity relying on outdated, cumbersome medical image CDs. Digitalize their images and studies cost-effectively. Provide 24/7 web-based access to their ordering physicians on mobile and PC platforms. Drastically reduce the geographical and time barriers between image testing and diagnosis/treatment. Successfully meet HIPAA and FDA privacy and security requirements. 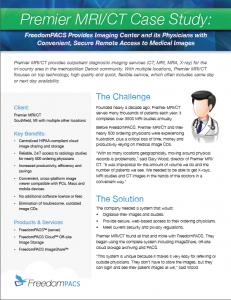 After implementing FreedomPACS, Premier MRI/CT experienced a more streamlined workflow, faster turnaround on processing and delivering medical images and radiology studies to physicians and significant savings on equipment and technology. As a result, the center was able to drastically improve radiology image sharing services for patients. “FreedomPACS enables us to archive our images across multiple sites–efficiently, inexpensively and with quick access regardless of where our doctors might be located,” said Wood. Read the complete case study to find out more! Get the same benefits as Premier for your medical facility or practice! Contact FreedomPACS online or call 855-740-1130 today.